Making connections with others, getting the word out about your plans, and dealing with legal or educational pursuits take most of your time. Serious promotional efforts pave the way to success. The strong influence of the Sun and Mercury in your health sector marks an excellent time to make an assessment of your health and to learn more about your body and its needs. Begin a new health regimen during the Moon on January 17. Your actions may, indeed, speak louder than words, but whether you’re talking or acting it out, your feelings about serious commitment are quite clear. Spend time reflecting on your needs during the Moon on January 1. An existing relationship needs a pinch of romance from January 3 to 15 to keep it alive. 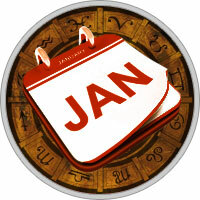 Although love blossoms after January 20, you may be fascinated by someone who’s not available. The Leo lunar eclipse on January 31 tests the need for mutual autonomy in partnerships. Education, fine-tuning your skills, or teaching others can be important to your career. Imaginative and innovative associations can open avenues you haven’t considered, although you’ll have to incorporate changes into a conservative framework from January 20 to 25 if you are to get funding. Give yourself time before leaping into anything after January 26. Negotiations and presentations fare well from January 1 to 15, but you can run into a stalemate after January 20 if you haven’t established necessary supports.